On Style Cartel, we’ve always believed that a good jacket should be a part of your wardrobe basics—, especially the comfortable and versatile kind. Jackets don’t easily go out of style, which makes them practical investments. And the one type of jacket making waves right now is the puffer jacket. It’s making quite a comeback in the fashion world, as it was prominent on the Fall 2018 runways. Fashionista notes that designers have even reinvented the usual puffer jacket by adding texture, prints, and even length. Kate Spade New York’s version even has ruffles, while Kim Shui’s offered a variety of longer designs. This proves that puffer jackets can be reinvented to be more fashion-forward. It’s a great piece of clothing to own, regardless of whether you’re a man or woman, as they are easy to style and are timeless. You can wear it during winter, and it’s one of the best ways to make a statement—a simple all-black outfit can look extra chic and classy if you throw in a silver puffer jacket. The Trend Spotter also highly recommends yellows, pinks, and reds, if you want to add a vibrant pop of colour to your wardrobe. Don’t worry about looking too chunky, either! Celebrities are currently going crazy over oversized and chunky puffer jackets, but the Telegraph suggests making sure it’s not over the top. Opt for ones that, although oversized, won’t make you look like you’re walking around wrapped in a duvet. You can choose designs that have capacious sleeves, roomy hoods, and even padded collars. These will make you look stylish without compromising comfort. If you want to add a little personality to your ensemble and to make sure you don’t look too casual, try a scarf or pair your puffer with a good set of heels. What you accompany your jacket with also makes or breaks your entire look. It’s often best worn with cropped jeans and ankle boots for women and mountain-ready garments for men. Guys will look good (in a causal way) wearing their puffer jackets with a good-quality flannel shirt and a roll neck on top, along with heavy denim pants or cargo trousers. A lightweight puffer jacket is also a great option because you can wear it along with other winter garments. You should be able to pack it easily in a suitcase, too. The Woman Within packable puffer jacket is a very lightweight design made to compress and fit into a pouch. This makes it much easier to carry around or pack into a small bag. Ultra-light jackets also provide a slim fit and tailored look. No matter what type of jacket you buy it should always look fitted. 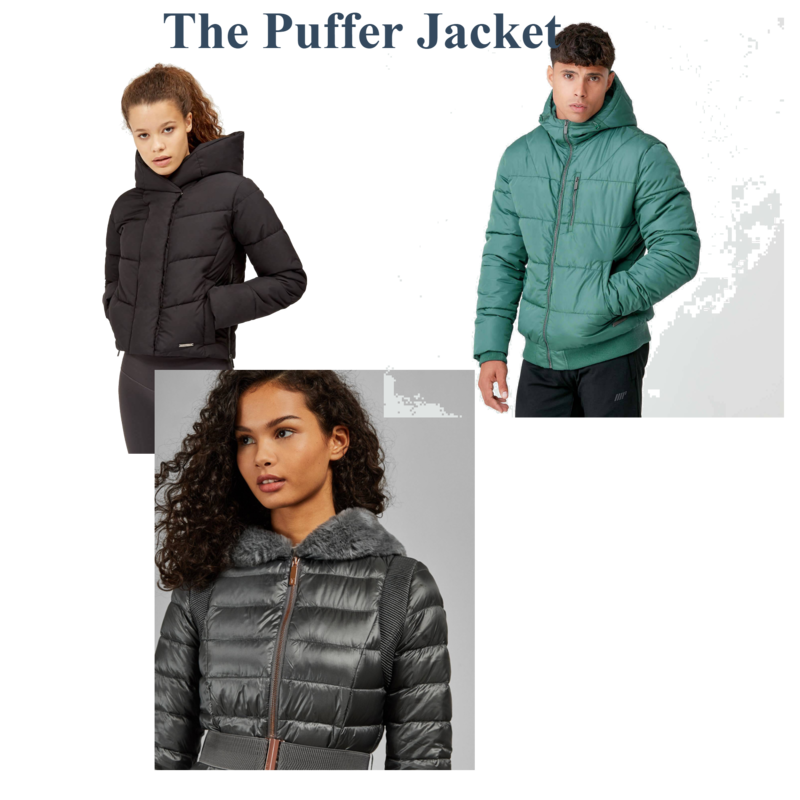 All4Women points out that if your puffer is too small, you won’t be able to move and if it’s too big, it will look baggy on you. Don’t be afraid to add textures like faux fur and leather, as well as accessories like hats and draped scarves. Designer belts can also make puffer jackets look classy and perfect for work. If you’re feeling bold and adventurous, you can even opt for the puffer vest instead of the full jacket.